A sample of fullerol C60(OH)24 was synthesized. The basic physicochemical characterization of the synthesized fullerol was done. The non-isothermal kinetics of C60(OH)24 dehydroxylation has been investigated. 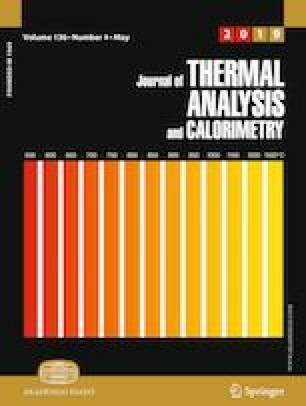 The thermogravimetric curves have been recorded at different heating rates ranging from 5 to 25 K min−1. By application of the Kissinger–Akahira–Sunose isoconversion method, it was found that the activation energy complexly changes with the dehydroxylation degree. The possibility of mathematical description of the kinetics of fullerol dehydroxylation by logistic function was investigated. Fullerol dehydroxylation conversion curves were completely mathematically described by the linear combination of two logistic functions at all of the investigated heating rates. The changes in the values of parameters of logistic functions with heating rate were established. It was shown that complex kinetics of C60(OH)24 dehydroxylation consists of two consecutive dehydroxylation reactions (low-temperature and high-temperature components). The values of the kinetic parameters for two components of dehydroxylation process were calculated. A model for fullerol dehydroxylation has been discussed. This investigation was supported by the Ministry of Education, Science and Technological Development of the Republic of Serbia trough Project 172015OI.